At Pelican Landing Dental, we offer crown and bridge treatment to the residents of Estero, Bonita Springs, and surrounding communities. Provided below is a brief overview of crowns and bridges. If you would like to schedule a consultation or if you have any questions at any time, feel free to contact us. A crown is a common dental treatment. A crown is a custom made "cap" to place over a prepared tooth. Crowns can be made of metal, ceramic, zirconia, or a combination of these materials. Crowns provide excellent coverage for a damaged tooth and can last decades! Crowns are the designated treatment for several different reasons. Teeth that are excessively decayed, misshapen, discolored, fractured, or have received a root canal are candidates for crown treatment. The process is as follows; the tooth that needs the crown is reduced in size to facilitate the space for the crown. If too much tooth structure has been lost, a buildup will be placed on the tooth to ensure enough tooth structure to hold the crown in place. The dentist then makes an impression of the prepared tooth and sends the information to the lab. 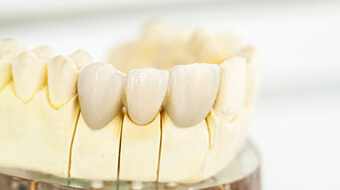 During the time that the crown is being fabricated in the lab, the tooth will have a temporary crown placed on it so that function and esthetics are maintained. Once the crown is completed at the lab, the dentist will cement or bond the permanent crown to the tooth. The results can be indistinguishable from adjacent natural healthy teeth! Along with implants and dentures, a bridge is one of the treatments available to replace a missing tooth or missing teeth. A bridge utilizes healthy teeth next to areas that teeth have been lost to essentially form a "bridge" to fill the gap. The gap where the tooth has been lost is now replaced with an artificial tooth. This restores function and esthetics. To make a bridge, the dentist will reduce the tooth structure of the teeth that are supporting the bridge. Each of these teeth will receive a crown that has specialized attachments to hold the bridge in place.